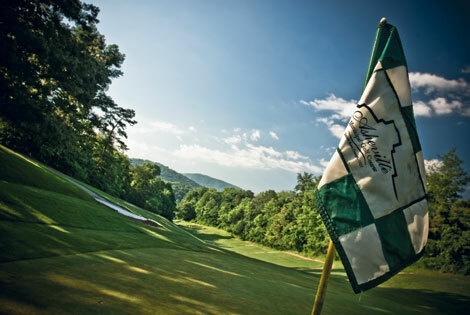 There’s a wonderful snippet of well-intended wisdom on the scorecard at Linville Golf Club that succinctly states, “CAUTION: at this altitude the ball flies further.” It’s a truth that explains one of the fringe benefits of playing golf in our mountains. But there’s much more to golf here than altitude and landscape. 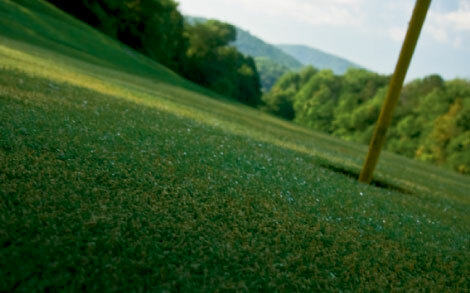 There’s a history stretching back to 1892 when the game was played for the first time in North Carolina at Linville. 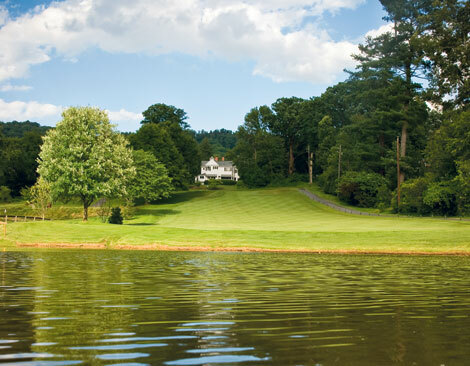 Beginning in 1919, the Grove Park Inn Resort & Spa hosted many of the game’s greats, and Asheville claims the state’s oldest municipal golf course. Furthermore, players and designers such as John Brooks Dendy, Billy Joe Patton, Donald Ross, and Tom Fazio have all called our region home. 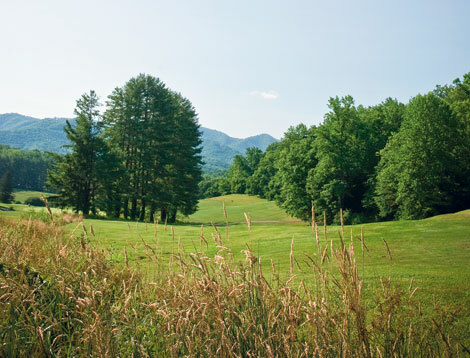 This heritage—and let’s be honest, the topography doesn’t hurt either—has made Western North Carolina one of the best places in the country to chase a little white ball. Today, you can test your skills in the shadow of the highest peak this side of the Mississippi, find out what it’s like to challenge a 747-yard par six, or fire a shot down a fairway that’s the loftiest elevation in the East. Before you plan your next round, take note—and heed—of these outstanding local holes. We’ve given you some tips on playing a few of the area’s longest, prettiest, trickiest, and most historically significant fairways. Just remember, every shot you hit, good or bad, will travel just a little bit farther. Linville Golf Club | #3, 452-yard par 4 Designer: Donald Ross Golf has been played around Eseeola Lodge in Linville since the 1890s, making it the birthplace of golf in North Carolina. But it was the contribution of the legendary Scottish architect Donald Ross nearly 30 years later that created a mountain classic. His third hole here, ranked among the 100 greatest holes by Golfweek, stands as testament to the master’s touch with its tricky tee shot over the crest of a hill, followed by a lengthy uphill approach over a creek to a small, diabolical green that requires a deft touch with the putter. A par here will definitely put a smile on your face. Mount Mitchell Golf Club, Burnsville | #6, 145-yard par 3 Designer: Martin Hawtree This may be one of the few holes around where it’s easy to lose your ball in the distant scenery, especially when the spectacle of fall burnishes the slopes of surrounding Pisgah National Forest. 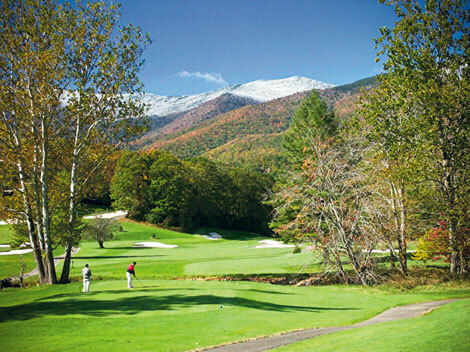 Take in this dramatic par three, which plays from a valley framed by a neck-craning view of Mount Mitchell’s 6,687-foot peak only three miles away. But don’t get too swept away as you still have to make a tricky quick putt for par. Regardless of the season, this course is always worth the curvy drive. 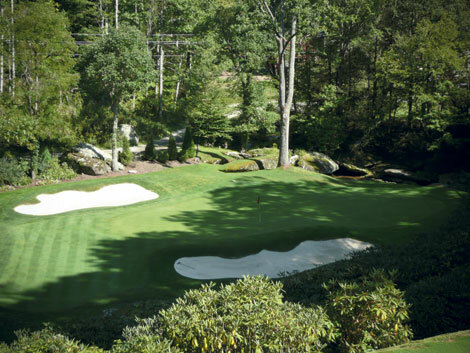 Wade Hampton Golf Club, Cashiers | #6, 135-yard par 3 Designer: Tom Fazio The opportunity to design this course was the challenge that first brought master designer Tom Fazio to North Carolina (he now lives in Hendersonville). His efforts here produced a work of art that is ranked among the top 20 courses in the United States by Golf Digest and among the top 100 in the world. 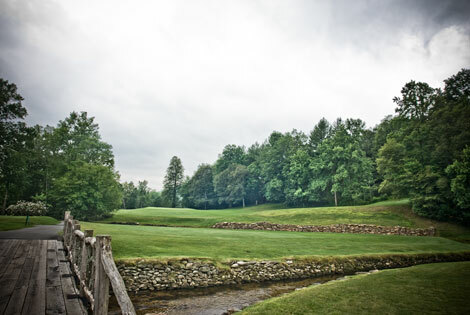 Pete Matthews, the club’s director of golf, terms #6 “a special hole,” where two swift-flowing creeks converge just below the green to present a visually intimidating test from the elevated tee. Reems Creek Golf Club, Weaverville | #18, 500-yard par 5 Designer: Martin Hawtree If the round hasn’t been humiliating enough by this point, the 18th at Reems Creek can deliver the final blow to your ego. With the clubhouse crowd enjoying drinks just a few yards away, you’re facing an uphill third shot to a humped green surrounded by five bunkers. That is, of course, after a blind tee shot and assuming you’ve navigated around the lake at the bottom of the hill. Land short of the green and you can expect your ball to roll back to you or into sand. A putt from the wrong tier also has the potential to draw sarcastic golf claps from the audience, especially if it leaves the putting surface. But look at it this way, if any spectators feel particularly sorry for you, they might buy you a drink to ease the pain. Grove Park Inn Resort & Spa, Asheville | #6, 340-yard par 4 Designer: Donald Ross Let’s say you hit a solid tee shot, clear the lake, and are now planning your assault on the pin that sits well above you—framed by bunkers on the left and right. Don’t expect that Donald Ross cut you any slack when he designed this green. Land short, and the false front will return the ball to your feet. Most demoralizing (and I speak from personal experience) is to putt from the back of the slick green to a front pin, give it a little too much juice and watch in disgust as the ball topples over the edge, and tumbles down the slope—leaving you to try it all again. Balsam Mountain Preserve, Sylva#8, 412-yard par 4 Designer: Arnold Palmer First, admire the views, which are spectacular. Then, from 100 feet above the split fairway, take your best guess as to what shot will find the short grass below. The worst part is that you may have to watch and wait 10 or more seconds to determine the outcome, which even then is tough since only a portion of the landing area is visible. End up in the 30-foot strip of thick Kentucky bluegrass bisecting the fairway and it’s hack-out time. Oh, and there’s also the very narrow green, which is guarded front and back by a rock-walled stream. But remember, the view is nice. 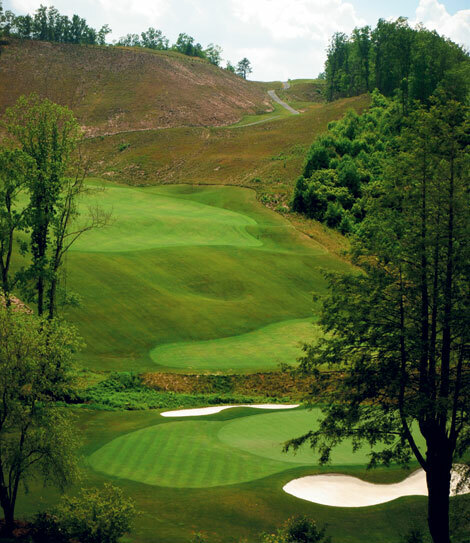 Sequoyah National Golf Club, Cherokee | #4, 320-yard par 4 Designer: Robert Trent Jones, Jr. Players will discover a true risk-reward hole when Sequoyah National, under development by the Eastern Band of Cherokee Indians, opens in September for daily fee play. This relatively short hole offers a chance for even average hitters to carry the dogleg, while long-hitters will give the green a go from the elevated tee. Not that potential trouble doesn’t lay ahead: A collection of bunkers guard the inside corner of the dogleg, while a deep ravine borders the left side of the fairway. Clear these and a devilish three-tiered green that will guarantee some knee-knocking putts awaits. All in all, it’s a clever hole that promises plenty of fun. 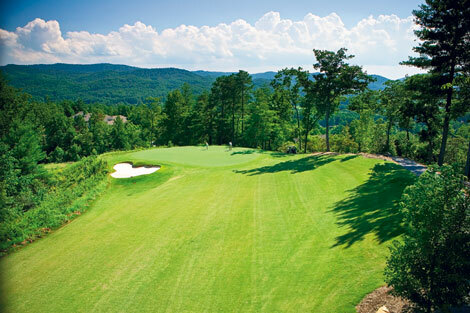 Cherokee Hills Golf & Country Club, Murphy | #14, 401-yard par 4 Designer: William Wells If you really want to claim that you’ve played across the state, from the mountains to the sea, then this is as far west as you can slap a golf ball. From the elevated tee, aim at the setting sun and follow your drive toward a green guarded in front by a creek. As far as golf goes in Western North Carolina, this is the end of the line. Linville Ridge Country Club, Linville | #13, 474-yard par 5 Designer: George Cobb When you make it to the big tree at the 200-yard marker on this sweeping hole, take a moment to check out the panorama and celebrate that you’re at the highest golfing elevation east of the Mississippi. At 4,945 feet above sea level, you actually may see a plane or helicopter descending past you for a landing in the valley as you ponder your own touch-down on the green, which may not be as far as you think since the ball will fly higher and longer at this elevation. Black Mountain Golf Course, Black Mountain | #17, 747-yard par 6 Designer: Donald Ross & Ross Taylor There are long holes, and then there are absurdly long holes. Once the longest in the United States (now a respectable fifth), plan on four shots to reach the green since positioning is more important than you’d imagine. Yes, it’s downhill from the tee, but the seven-football-field-long fairway is narrow with encroaching trees on the right, and then slopes left toward a creek. It’s a treacherous journey just to reach the small, slightly crowned green. However, take heart since there actually have been three double-eagles recorded here. 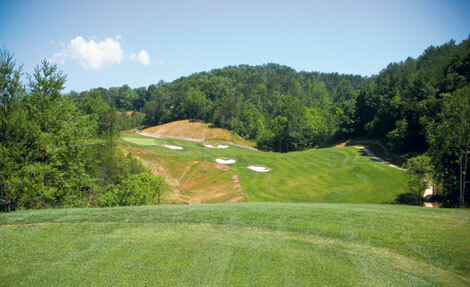 The Cliffs at High Carolina, Asheville #14, 298-yard par 4 Designer: Tiger Woods Even though dirt is just starting to move, word is that Tiger is very pleased with the risks and rewards offered by this drivable par four on his first U.S. design project. Starting from a tee box situated approximately 4,000 feet above sea level on the mountaintop plateau, the fairway drops sharply to a narrow landing area. The suggested smart play is to stay short and left, then pitch on. But no one has ever accused most golfers of being smart when tempted with the opportunity to blast a long shot in hopes of glory; so expect the front bunker to gather its share of wayward attempts. Asheville Municipal Golf Course #11, 353-yard par 4 Designer: Donald Ross The president of the Donald Ross Society has described Asheville Muni as a “step back into the 1920s and a hidden gem” that preserves much of the designer’s original intentions. Constructed in 1927, it’s the first municipal golf course built in North Carolina and has earned a place on the National Register of Historic Places. But perhaps more important, it’s a welcome oasis for a well-priced, low-key outing. In the mountain spirit, the 11th hole is a steep upward grind, which rolls up to a green that promises adventure in the finest Ross tradition. Bright’s Creek, Mill Spring #19, 134-yard par 3 Designer: Tom Fazio No, it’s not the traditional 19th hole where adult beverages are dispensed, but an extra hole that designer Tom Fazio added ostensibly to give players a last chance to settle any bets. Thus, it’s appropriately named the Hog Hole. Playable from 80 to nearly 200 yards, this is no pushover. It requires a full carry over a pond that guards the front, left, and back of the green. And Fazio added enough intrigue to the putting surface to make certain you’ll have to earn that last chance to get even. Hound Ears Club, Boone #15, 93-yard par 3 Designer: George Cobb This is “just a fun little hole,” according to Grandfather Mountain’s Harris Prevost, a member of the North Carolina Golf Panel. Take the tunnel to the tee that overlooks the challenge down below, including a narrow green, the menacing presence of four sizable bunkers, and a brook that makes hitting a half-wedge a mental and physical adventure. Throw in a little wind to add to the fun. Once you’re safely aboard, there’s enough slope on the slick green to demand full concentration to make par. Rock Barn Golf & Spa, Conover #18, 487-yard par 5 Designer: Robert Trent Jones, Jr. The PGA Champions Tour returns each September for the Greater Hickory Classic on the highly regarded Jones Course at Rock Barn. The 18th is a solid finishing hole that’s seen its share of final round heroics, including a putt to win it all in 2004 and a sudden-death playoff in ’06. The pros tackle this hole from 569 yards, but 487 yards is plenty for the average player since it’s all uphill from the tee with a left-right twist. Two strategically placed shots in the fairway set up an approach that calls for care due to the massive bunkers that protect the green. When you get there, just pretend you’re putting for the serious bucks with the big boys. Charlotte-based Gary Carter enjoys writing about golf almost as much as playing it. He’s a member of the N.C. Golf Panel, which annually rates the state’s courses. His novel, Eliot’s Tale, will be published this month. Sapphire National Golf Club, Sapphire #15, 138-yard par 3 Designer: Ron Garl This is a mountain version of the infamous island hole at TPC Sawgrass. Here, wayward shots also sleep with the fishes (in this case, healthy trout that cruise by the shore). It’s an intimidating sight from the elevated tee, and not for those who can’t bear to perhaps drown a perfectly good Pro V-1. A recently added pot bunker in the front provides yet another challenge or, at the very least, a dry spot to land. By the way, don’t let the fact that this course is located at 50 Slicers Avenue put any negative thoughts into your head. Mountain Aire Golf Club, West Jefferson #6, 426-yard par 4 Designer: Dennis Lehmanp If you’re looking for a chance to show off your driving distance, this is the hole. “Let’s just say that 300-yard drives are very common,” says club owner Mark Hagel. “And 350-yard drives are not uncommon.” With an elevation change of more than 200 feet from tee to green, anything in the fairway gets plenty of roll. However, it’s not just grip it and rip it. 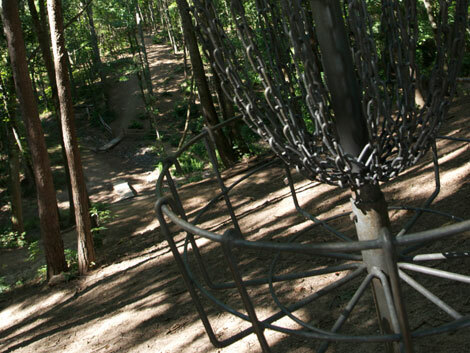 There’s out-of-bounds on the right, and a deep gorge runs the length of the hole on the left. But put it in the short grass and you’re looking at a very short iron to put it close, then plenty to boast about at the bar.